I hope everyone appreciates the dry humor of the title of this post. Also, the feature photo has nothing to do with anything except it was the only photo I had that sort of said ‘liberation’ so…. yeah. Disclaimer: this is not a pretty post; there’s no outfit inspiration, no aspirational lifestyle or dreamy travel destination. No cute style photos. It’s probably the opposite of that. My thoughts for the day – lately I’ve been a little bummed about the hyperfocus on materialism in basically all ‘lifestyle blogs.’ It seems everything is about what to buy next (and trust me, this site is no different), but very rarely is there ‘what to give next.’ I’ve been no exception to this. I love blogs. I love reading them. And I love blogging. I love storytelling, content creation, so on and so forth. But with the rise of lifestyle/fashion blogging and its prominence in popular culture, comes the promulgation of materialism and other selfish principles. I don’t love that so much. Sales, trends, must-haves… it’s all about how to amass the best and newest of what the brands of the world have on offer – RIGHT NOW – exacerbating this insatiable hunger for possessions. I had to unfollow some of the people I most admired in the blogging world (even though I still like their style), solely because I’ve been so discouraged by the vanity and materialism. It all feels really selfish. And I’m not here to be a downer, but it’s hard to have a completely clean conscious when you’re writing about how Chanel mascara “is totally worth the extra $” (guilty 🙋), while you also know that a child dies every 20 seconds from a water-borne illness. I know, I know… here comes deeeebbie downer! I’ll avoid writing the horrific statistic I read while I dropped off my donation items this weekend, but you get the picture. Things are not so awesome for millions of people globally, so I wanted to take this moment to put a piece of altruism into the interwebosphere. So the problem here is two fold: One – we, as a society (and this is a generalization so forgive me), are attached to material possessions. And that, in a way, is bogging us down mentally, emotionally, financially, and spiritually. Two – there are people in need, everywhere, who could benefit from even the slightest bit of selflessness. But there are steps we can take to make a difference for the lives of others AND begin to detach ourselves from STUFF. Fr. Baron suggested a couple tools that resonated with me, in an attempt to free yourself from attachment to materials and give back: 1) take something you like in your closet, once a month, and give it away (it’s hard, right?!) 2) when you’re making a purchase, for example, a car – get the model down from the one you want, and donate the difference to charity. Buy the less expensive version of that couch, that sweater, that lipstick, and donate the rest to a good cause. It’s quite the challenge, but I’m excited to start trying. You could even start small and say, for every new thing I buy, I’ll give away an old thing. my mom made me take this photo for tax purposes. thanks mom. 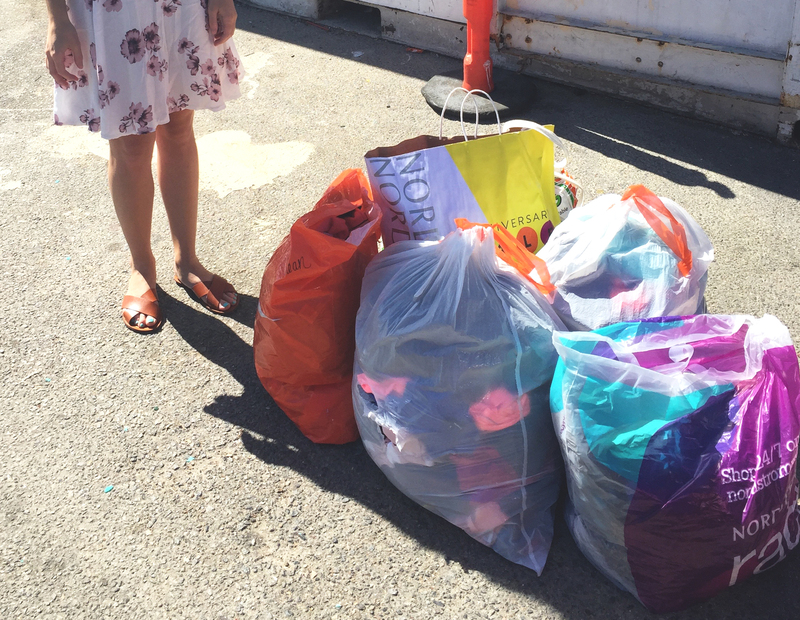 Over the weekend I donated 175 items from my closet. It sounds like so much, but I still have a TON of clothes (and I do realize the irony of donating clothes in a Nordstrom Anniversary Sale bag; the joke is not lost on me, trust). I read a statistic once about women only wearing a fraction of their wardrobe (including this alarming one here) – the truth is, we really don’t need a lot, and we almost certainly don’t need all the things that we own. This is starting to sound like I’m trying to toot my own horn or give myself a huge, digital pat on the back. Look how charitable and wonderful I am! I’m so altruistic yay me. Definitely not the case. I have spent more on myself this year than I have on others – that’s a fact. But I’m working on it, and I wanted to share these musings and thoughts with all of you; I figured it would be at least one tiny piece of positive inspiration out there in the universe, and potentially begin to make the world a better place. Hopefully you’ll be inspired enough to pass it on. Happy donating. You know what to do. We have a friend who takes all of our unused items to the Dominican Republic! I have to say though, I would have loved to rummage through your donation pile!